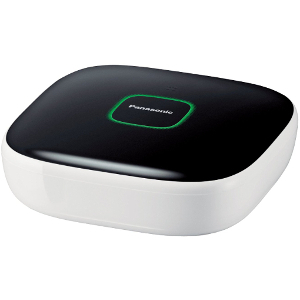 Keep an eye on what is most important to you thanks to this Do-It-Yourself home monitoring system from Panasonic. 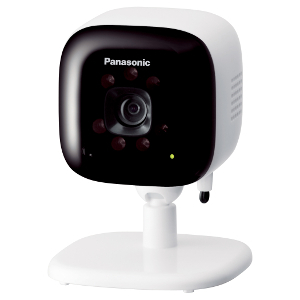 The Panasonic Home Surveillance System is designed to monitor two interior areas or one area from two different angles, the wireless, do-it-yourself video surveillance kit includes a DECT-enabled hub unit, and two indoor cameras to cover entrances, the baby’s room, family room, or other key interior locations. The two interior cameras can be hidden away on a shelf, mounted to the wall, or discretely placed to keep an eye on the things that matter most to you, and synced to the system’s hub unit within seconds. Monitor remotely and record real-time video. The indoor cameras provide clear coverage. Each is equipped with sound and video motion detectors that, when activated, send an immediate alert to your smartphone and or tablet. In the same instant, motion-activated audio and video are recorded automatically to a high-capacity MicroSD (32GB max) card (not included) in the hub unit. To view video, simply remove the MicroSD card from the hub unit and insert into your laptop or desktop PC. The DIY surveillance camera kit takes full advantage of the DECT technology that allows the system to maintain a clear, secure and long-range signal throughout the home. You can configure, install and control the system yourself. Plus, there’s never a monthly fee to pay. Easily monitor system activity from inside your home or remotely from via your smartphone and tablet. Receive alerts on your smartphone and table, or via the system’s cordless handset (not included). Download Panasonic App. Connect hub unit to your WiFi router with the touch of a button. Add and pair system components with one-touch convenience. Check connected home system status with LED status indicator light (green, yellow, red) on hub unit. Monitor indoor rooms and spaces. Initiate two-way communication with built-in microphone and speaker. Record video to Micro SD Card (not included) and view on your PC or smartphone. Use visual sensor and infrared motion sensor to trigger other actions (start recording, turn on light). Arm, disarm and monitor system activity from inside your home or remotely via your smartphone and tablet. Receive alerts on your smartphone and tablet, or via the system’s cordless handset (not included). Simple DIY installation and one-touch pairing with hub unit. On Sale – Read The Reviews and Buy Here! This entry was posted in Products and tagged Home, KXHN6099W, Monitoring, Panasonic, System on May 18, 2016 by Andrew S.
One camera dead out of box, replacement cost $250, not the original $140!